Sing Hosanna! Another beer bar has opened up in Oxford! And weirdly, it wasn’t that busy when we arrived on a nondescript Wednesday evening in mid-September, but The Pint Shop has only been open a couple of days, so it’s no surprise (their original Cambridge bar being open a great deal longer). But before long, I fully expect The Pint Shop to be rammed to gunwhales with discerning Oxford drinkers and attracting some of the frothy-‘tached hipster crowd from Beerd, a couple of doors down. Having two decent* beer bars in the same street plays well for us drinkers – meaning that both outfits need to stay at the top of their game to retain their custom by stocking the freshest and widest range of quality beer. It’s a nice set-up when you get inside The Pint Shop, their style blows away the seemingly-now-passe craft-beer/rock-bar schtick and instead mines a rich seam of late 70’s/early 80’s “comprehensive school” chic: enamel light shades and flip-top-desk-beech furniture with bare floor-boards lend it that sort of feel. I liked it a lot…mind you I was at school in those years, so I would wouldn’t I? And guess what else I liked a lot? The beer selection. Holy crikey – check out the picture above. That’s a range and a half, isn’t it? Gregg wasn’t sure what to order when we arrived and visibly reeled and buckled at the knees under the weight of choice; eventually, after expressing a need for “something with lots of hops in it”, he settled on the Everyday IPA from the Nene Valley brewery. It was perky and sessionable and delivered hops by the shovelful. As I’m currently on a sours kick I went for the Mangoes Crazy for Peaches Berliner Weiss from Beerbliotek – which was just what I was after: pleasantly seltzery with just enough acidity to pucker, it sat nicely on my (very empty) stomach and sharpened my appetite for dinner later. It was imperceptible first, but then became weirdly rhythmical: one minute we were starkly lit by bare element bulbs, the next we were in plunged into an other-worldly gloaming…it was all very odd, until a chap appeared next to us and apologized – explaining that they were trying to get the lighting right and they’d be done fiddling about soon. We said we didn’t mind, as the beer was good and were wondering what to have next…so the lighting man introduced himself as Rich and explained that he was one of the co-owners and, what sort of thing were we looking for next? The Hoog and Droog was a solid and beautiful west coast IPA, with a great trailing edge of zesty grapefruit pith. Gregg declared it an excellent beer and one of the best he’d ever had – and believe me he’s had a few in his time, so his opinion is to be respected. The Sangria Sour was satisfyingly acidic and nicely balanced – I’m guessing it was kettle-soured, as it wasn’t wildly complex in the way that a gueze or flanders red is complex, but it was damn good all the same. Burning Sky’s Saison a la Provision was an excellent representation of the style and refreshing and tasty in equal measure. I wish I could make my Saison taste that good. The star of the show was the Evil Twin Barley Wine Blend. My god, it was big (11%) malty, rounded and spicily woodsy; quite bringing to mind bulbous Christmas snifters brimming with Armagnac… I’d never considered brewing a barley wine before, but I might now. I’m so happy we’ve another decent beer destination in Oxford. 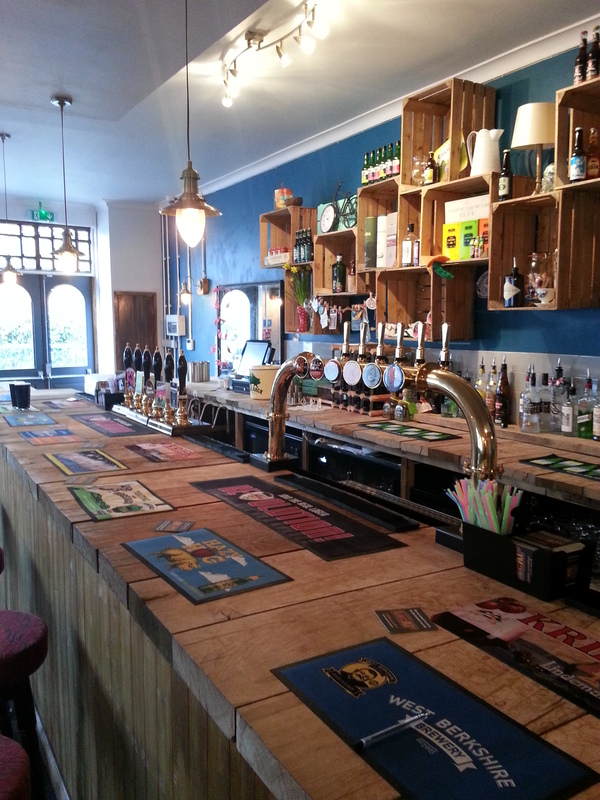 The Pint Shop is spacious and well laid-out with a blinding selection of beers. Everyone there is knowledgeable and happy to help. I haven’t even mentioned the food yet…God, yes, the food. Next time, Jon. Next time. Guess who’s getting a massive sue-ball in the face, eh? So, a can of Fresh from The Wild Beer Co. then, how did that happen? As it was, a little googling revealed that The Grapes in George Street, Oxford has been re-jigged into a new craft beer and pizza joint called “Beerd” (http://beerdoxford.com/), I had a quick shufty at their twitter feed and it seemed like they knew what they were talking about beer-wise, so we duly trundled along. Beerd reminds me very much of the gig that the Craft Beer Company, Brewdog and others of that ilk run: it’s clean, slightly retro, impossibly “now”, slightly shabby chic and rammed to gunwhales with bottles and taps and stuff. I had a RedChurch Boreft Saison, which was beautifully dry and fruity and Saisony and everything that I really wanted it to be. I also had a Siren “Dinner For Ten” Vienna Pale Ale, which was nicely toasty and pleasantly hoppy. Only thirds of each, so I could drive safely later on. Remaining sober allowed me to admire the nice selection of beers that Beerd had on while the chap behind the bar stressed that his cellar cooling was being sorted out, so there’d be more beer soon as they’d got loads of kegs and barrels of all different sorts downstairs, all ready to go. Money safely pocketed, chap said: “I’ve got a keg of Fresh downstairs, which I can put on in an hour or so if you like?”. But I’m going to follow these folks on twitter and visit them often, as they clearly know what they’re at and seem to have an eye for a nice range of beer. Opening with a lively “fssssst”, FRESH! (I did it, see?) pours a gorgeous orange amber with a smart white cap that quickly fizzles off to a slick sea-foam covering. The aromas that came at me were thick and marmaladey, with frills of citrus and pine around the edges. Weirdly, in the background I picked up a faint roasted note, which rounded the whole thing out nicely. Taste-wise Fresh (I’ve stopped now) is assertively hoppy, with a whirl of floral, pine and citrus – all underscored by a dryish but solid malt body. Let’s get this straight: England has museums and England has old Breweries, but England does not have museums with Breweries in them; which is a shame because in the US of A they do. Carillon Brewery is situated smack in the middle of Carillon Historical Park in Dayton, Ohio. Carillon Historical Park is one of those living museum sort of affairs -a bit like the one at Iron Bridge Gorge, Telford in the UK. Carillon brewing specialise in producing beers in the same way that all breweries would have many years ago. When we arrived it was nearly dark and we headed straight to Brewery restaurant (yes. Beer and food. How nice is that?) As it was so late in the day there wasn’t a lot going on apart from some poor old morose-looking lad in a smock slowly cranking an old wooden grain mill. The Carillon Porter – much as it would have been in the dim and distant, this was a dark malt-heavy interpretation of the style with quite a thin body and a vinous, almost sour note to it (caused, I’m guessing, by a smidge of oxidation from the barrel fermenting or ageing?) It was nice enough and provided a glimpse into how beer must have been back then. The Carillon Coriander Ale – lightish and again with a minimalist body, I found the coriander just a bit too much. This beer was all about the coriander and not much else. But again, it’s harsh to judge these beers by modern standards. Maybe that’s how they dug them, back then? The Carillon Spiced Dunkelweizen – was a good solid dunkelweizen, nice body, good alcohol, very nice; however, the spicing was just too christmassy for me…I like me spices in a beer to be gentle and subtle…but other than that, very enjoyable indeed. The brewery takes it’s name from the kink that the Wright Brothers -Dayton’s most famous sons- engineered into the wings of their first “plane” that allowed the first human flight. 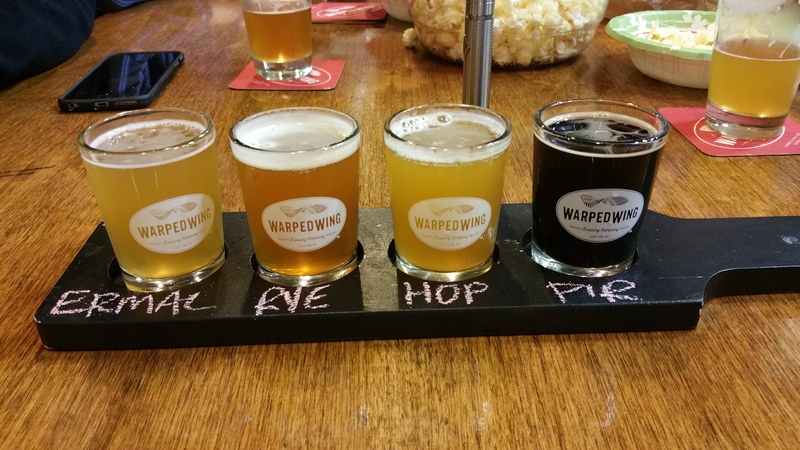 Situated in down-town Dayton, Warped Wing has been in operation for just over a year now and seems to be garnering the interest of a good chunk of the region’s craft beer crowd with it’s range of eclectic and lovingly-made ales and beers. We rolled in to the old converted steel foundry on Wyandot street that is the brewery’s home, just after 8pm, where a youngish crowd were enjoying some of the 5 or 6 beers available that night on tap; there was a good background hum of conversation and relaxed revelry all against the backdrop of the brewery plant itself – a magnificent vision of stainless steel vats, fermenters and pipework – where a magnificently-bearded brewery employee was busily washing off the plant after that days brew session. The atmosphere inside was warm, convivial and welcoming – laden with the aromas of an earlier mash and heavily-hopped boil. 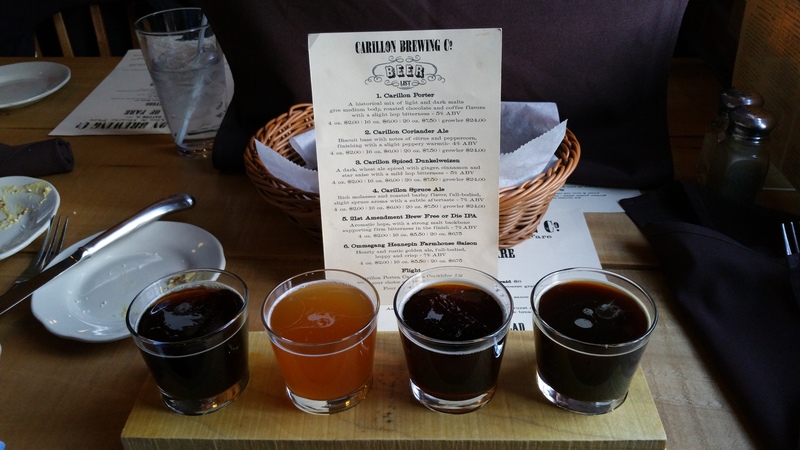 As I wanted to try everything in sight, I opted for a full flight of Warped Wing beers: Ermal’s Belgian-style cream ale, Flyin’ Rye IPA, Hop Smuggler IPA and Pirogue – a Belgian Quad style ale. First-up, Ermal’s Belgian Cream Style Ale: this was a lovely hazy yellow and had ample spicy notes in the nose – with a satisfying peppery-spicy dryness that really quenched my thirst, even though it was just a small taste. The Flyin’ Rye IPA was assertively hoppy, yet restrained enough to allow the cracker-bread, spicy, graininess of the rye to shine through – I liked this one a lot, as I have a peculiar fondness for beers brewed with rye. Hop Smuggler was an odd choice of name for the next beer, as it makes very little attempt to smuggle the hops past you, preferring to allow their full power of their resinous dankness to smack you fully in the face; slightly hazy and beautifully balanced this was a great IPA. Next the Pirogue. Belgian Quad style ale is not something that we get a lot of in the UK, but I wish we did – complex and powerful (9%!) it satisfied with every sip, and if I was only allowed to have one more glass of any of the Warped Wing beers, it’d be this one…just excellent. And then as if it wasn’t enough to be sat in the brewery itself; drinking excellent, achingly fresh beer that had been brewed not more than a couple of feet away from me; Bill looked around and said “Hey, there’s Joe!”. 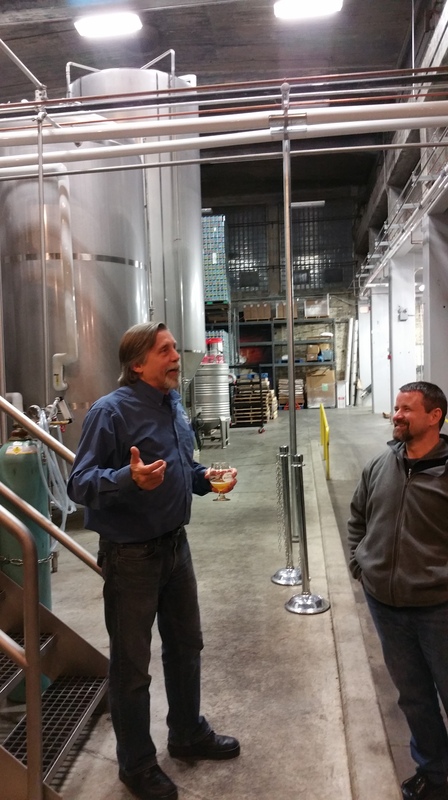 Bill explained that Joe was one of the founders of Warped Wing and we should go say hello, as Bill works closely with Joe’s brother Andrew. 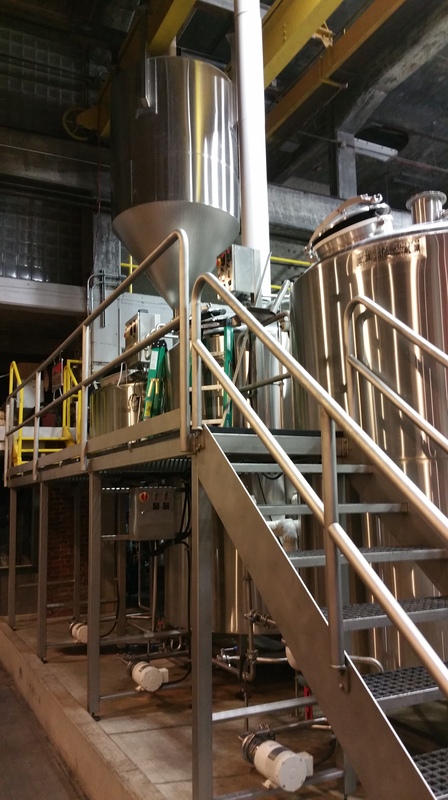 As we talked, I handed Joe a YIMB card and he insisted – despite only coming in to the brewery for a post-basketball beer with friends – on giving me and our small party a whistle-stop tour of the plant. I can’t tell you how good it is to be given a tour by someone so obviously knowledgeable and proud of their brewery and business. 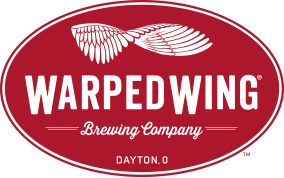 Warped Wing is doing all the right things: they’re brewing twice a day, six days a week, they have a modern canning line (they’re the only folks in Dayton who are canning their own), they have a barrel-ageing program on the go, and are supplying their excellent range of beers to 50 or so outlets – including at least one local stadium. 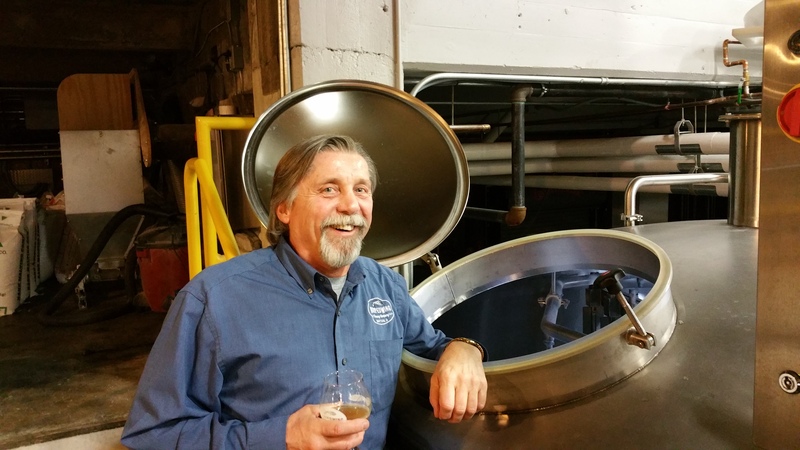 Warped Wing’s head brewer is a guy that came from the New Holland brewery and – unbelievably – doesn’t run a pilot system. He just runs full 66BBL test batches by dialling them in on the kit, and as Joe testifies: 99.9% of the time he gets it smack on and a great beer ensues. I’d like to extend my thanks to Joe for taking the time out to show us around and telling us exactly how they do their thing. I guarantee you’ll be seeing a lot more of Joe and his folks’ beers – the quality, branding and style, plus their obvious passion for doing what they love will see the Warped Wing empire expanding rapidly. I insist that you go there and take in some of their beer and hospitality if you’re in the area. How bloody nice is that, eh? I went out for a curry at the Standard on Walton Street in Oxford with some friends on Saturday night and was astounded to find that they had a craft beer menu. Yes, you read that right. A CRAFT BEER MENU. 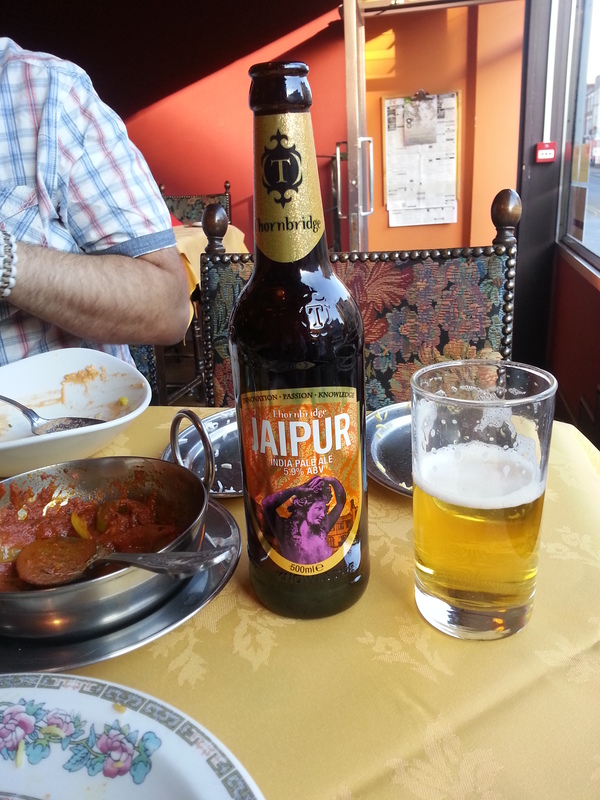 James told me that he booked the restaurant solely because they had Thornbridge Jaipur as a drinks option. I salute him and The Standard…which, as it turns out, was far from standard: really excellent food, cooked to perfection. I had a bit of Pand’s poached prawns in coconut, lime and chilli and it was heavenly. My Mirch Massalla (not far removed from Chicken Jalfrezi) was magnificent, too. 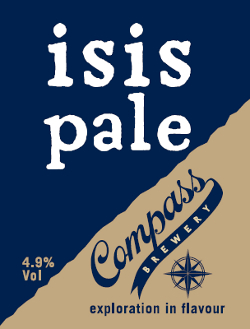 And if you don’t like Jaipur (maybe because you’ve got something wrong with you) there’s also Isis Pale Ale from the Compass Brewery – which is also an absolute corker of a beer, plus a whole small supporting cast of other choices. Guess which bloody idiot didn’t take a picture of the pump clip? Full disclosure time again: I’ve no idea if I’ve even got the name of this beer right. This was another one sampled at The Greyfriar in Reading – just after my latest AWS exam attempt. I was still reeling post-exam, so if anything ain’t right…let me know. An almond-infused chocolate stout…that’s something you don’t come across every day, and to be quite honest – I’d be glad if I did come across this sort of thing more often. Ink-black and with a fabulous, thinnish-but-inviting-looking, creamy head (I guess the nut oils are probably going to not help with head retention that much), the half I was poured looked and smelt good enough to eat. Strongly malty, chocolatey aromas poured from the glass with accents of warm nuttiness abounding; like I said it smelt damn good. The taste was an embrace of warm roasty, nutty chocolate – all laid about on a bed of sensual maltiness, langourously wrapped in smooth dark-chocolate bitterness. The after taste just went on and on and reinforced the excellent dark-bitter chocolate theme. In two words “Bloody Excellent”. I hope these folks prosper in their brewing endeavours…It’s just a shame that Almande might not ever be available again. The staff are friendly and knowledgeable, so just go in and see what they recommend. The whole place is all still quite new and still being worn in, so don’t expect oldy-wordly, but it’s clean, fresh and well kept. When I was there, there were 6 cask ales on and 6 keg taps, not to mention draught cider and a very intriguing looking bottle selection. They actually had Liefman’s Kriek on tap and also Delerium Tremens, too. (When I have to re-take that bloody AWS exam -which is pretty much guaranteed, BTW- I’ll be going back to take in more of their selections. Great pub, great location, great beer. What’s not to like, eh? A week or so back I managed to slip out for a couple of evening drinks with some friends at The Killingworth Castle in Wootton. The Killingworth is a pub that’s virtually smack on my doorstep but I haven’t previously had a chance to check out. It’s a few months since it re-opened under new management and my first impressions are that it’s improved considerably, with the obligatory country gastro-pub refit of stripped floors, subdued lighting, a reasonable looking menu, re-vamped events program, etc. Plus they seem to deal mostly in local beers and spirits, which is something to be applauded. We decided to sit outside in the nicely re-landscaped garden, but only managed an hour or so before the keen north wind forced us back inside. What is it with summers these days? 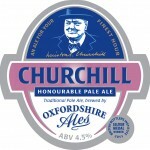 First up was Oxfordshire Ales Churchill pale ale, which was nothing like as good as I remember it from the bottle. This version was malty with a reasonable bitterness, a distinctly unremarkable character and really not that enticing. I must admit it was a bit of a disappointment as I was looking forward to trying it on draught as it’s so good out of the bottle. My advice: seek it out in bottle form if you can where it’s delightfully hoppy and refreshing. Then I moved onto The Compass Brewery’s Isis pale ale. This was a completely different kettle of fish: a nice mid-brown clarity that delivered a good amount of malty complexity and gave way to a lovely mouth-wateringly bitter finish; a satisfying mouth feel and a really good pervasive hop character made this a beer that I wanted to come back to again and again. Maybe it was the high standard of the Isis that made the Churchill seem poor by comparison? My one for the road was a stout by Freedom ales served from a keg on cellar gas and through a standard keg tap – which seemed wrong for a stout on so many levels and wrong it certainly was: way over-carbonated, making it “fizzy” – not gently carbonated, and served way too cold – both of which helped to kill most of the taste stone dead. What I could taste was drinkable enough, some complexity in the maltiness with a pleasant enough hint of roast barley running on through. Stout rules: serve on nitrogen, not cellar gas – use the correct tap and don’t serve it too cold! The Killingworth Castle is a smashing pub and the staff are great…they just need to sort out that stout!